This week I waved goodbye to the tropical temperatures of our recent heatwave and welcomed back the wet British Summers that we are accustomed to. Reminding me of the importance of wearing quality equestrian sportswear. As Stierna advocate; everyday is a good riding day and once we've done it, we're always happier for it. well, almost always. Stierna Equestrian Sportswear are a Swedish brand, established in 2015. The brand gets its energy from a strong idea, to develop technical equestrian clothes with high functionality for active riders, enabling them to perform optimally regardless of the weather. After being fortunate enough to meet Stierna's passionate founder Robert Kos at Badminton Horse Trials earlier in the year, I was asked to share my thoughts on a Halo top from their unique three layer system. As soon as it touched my skin, it felt different. Stierna's 'idea' for providing apparel that allows riders to solely focus on the interaction with their horse feels like more like an obsession. I found the Halo 1/2 Zip top a dream to wear. Incredibly soft, the asymmetrical cut of the fabric moved with me as I rode. The design is stylish and understated and is the perfect base layer, be it for hacking and schooling in Dark Navy, going cross country in Lovely Lilac or competing in Snow White under a smart show jacket, the high collar with a short zipper is the perfect base for a stock tie. Izzy Taylor, British Eventing's number one female rider expertly explains why she loves Stierna Equestrian Sportwear in the video below. Although it may sound silly to some, I smiled and whole heartedly agreed with Izzy's comments of finding comfort in wearing sleeves when riding, especially when away from home or competing. Layer one is only the start of Stierna's story...layer two is a necessity once the temperature drops because it is designed to trap warm air and keep the body heat in cold conditions. The technology allows heat to be evaporated ensuring you remain comfortable, warm, dry and in harmony with your horse. Layer three provides protection against the wind, rain and cold whilst releasing excess heat and moisture through the active ventilation openings and stretch panels built into the garments. A true shield against the elements, allowing you to perform at your best in all conditions. 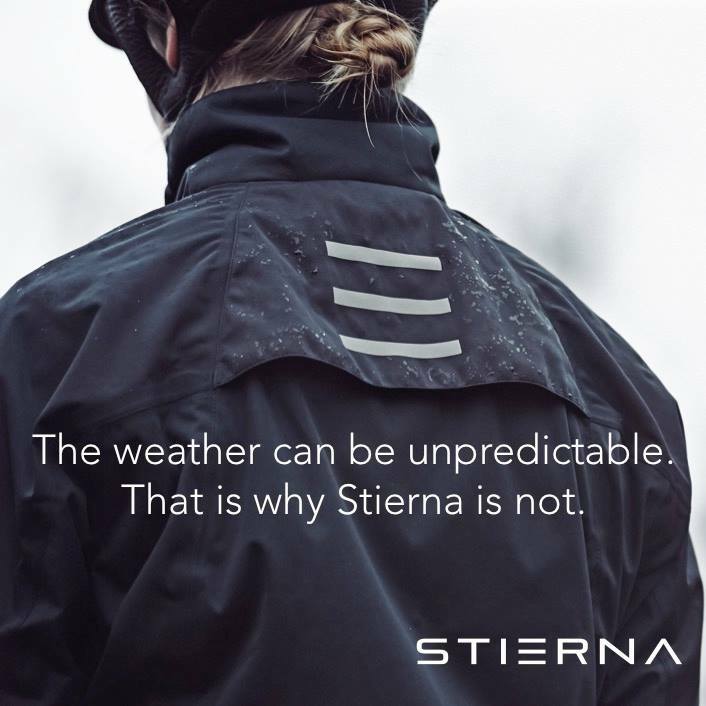 Equtex - a fabric based on a membrane technology, used in Stierna's high performance garments, allowing the outer fabrics to be waterproof whilst maintaining high levels of breath ability. Cool Anti-Odour - a TM of Stierna their bamboo charcoal fabric gives UV protection up the UPF +30 and comes with natural coolness and soft touch to keep riders dry and comfortable at all times. Air Drizz Softshell - apart from loving it's name, 'air-drizz' softshell is a high technology membrane with breath ability, waterproof properties and four way stretch. Like most, if not all of us life is busy. My horse is at a livery yard which means I don't bother with outfit changes. Once I am up, dressed and out of the house that is it for my days spent away from the office, wearing my breeches and as much as I hate to admit it, sensible footwear. Funny looks as I dart through town and around the supermarket dressed this way have become the norm. My current favourite pair of are by La Valencio. A brand renowned for the comfort and wear-ability of their breeches and we are lucky to have Equissentials Dressage a number one stockist in the U.K. With each fresh season I look forward to their new collection. Year after year adding to my wardrobe. The Spring/Summer Guardian Denim Breeches are perfect for Summer riding (and errand running), the denim is soft, thin and flexible with super sticky knee patches for security and a smooth, elasticated ankle to reduce any bulk under close fitting boots. 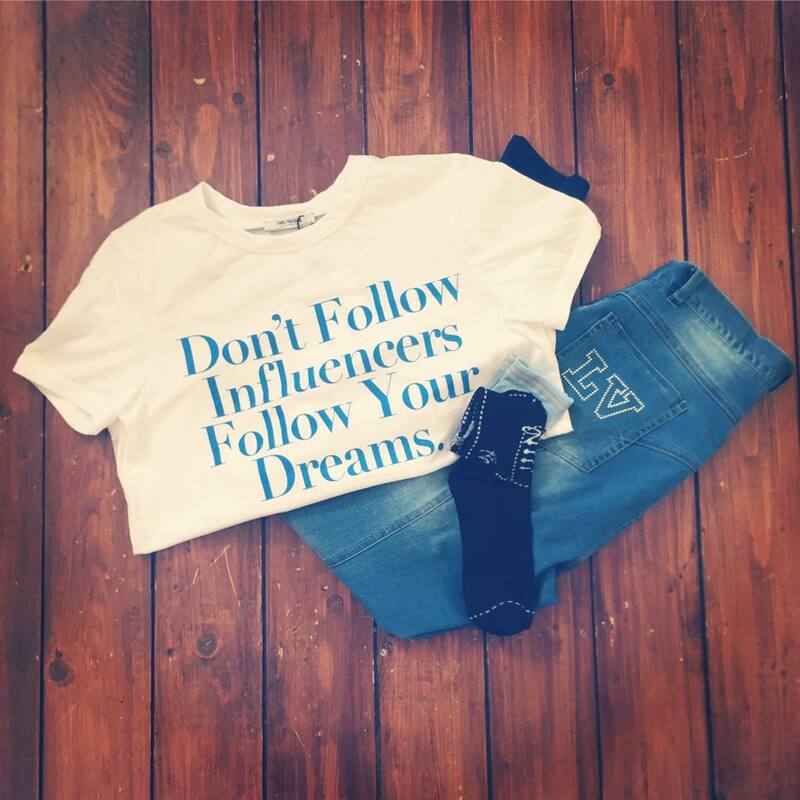 Not only are the Guardian Denim Breeches amazingly comfy to wear, they also look great. A gorgeous shade of denim blue, high waisted (I have to wear a belt), four pockets and a glittery LV logo on the bottom. During the recent heatwave they've been perfection to ride in because a full seat can just be too thick in hot weather. Purchased from Equissentials Dressage for £80 they are currently offering a 15% discount, £68 making me want to buy another pair all over again...buy here. 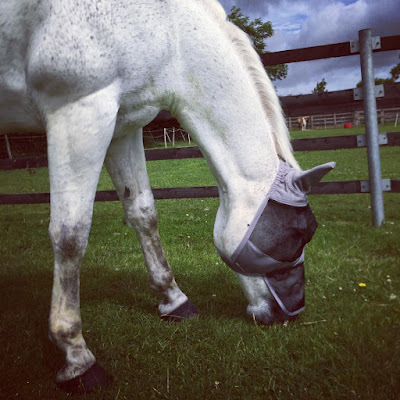 Oscar was wearing his fly mask in April, he is sensitive to all insects, bugs and critters, both big and small and even when the sun is only peeking through the clouds his eyes will water in irritation. Yes, the joke continues...how can my hardy native be so soft and sensitive? Because of this I was overjoyed that as an Official LeMieux Blogger for Horse Health Gee Gee and Me were asked to review their Comfort Fly Shield. As with all LeMieux products, they have designed their range of Comfort Fly Shield's with the horse in mind, 'comfort' being their top priority and we have come to expect no less from the trusted brand. The Comfort Fly Shield is constructed using a protective UV mess and lined with soft strips of black merino lambswool across the brow and nose to avoid rubs and wick away moisture on super hot days. The lambswool also doubles up as a benefit by providing a good stand off from the face. Teamed with the strong, structured mesh designed not to cave in it gives me total confidence the shield will stay in place. 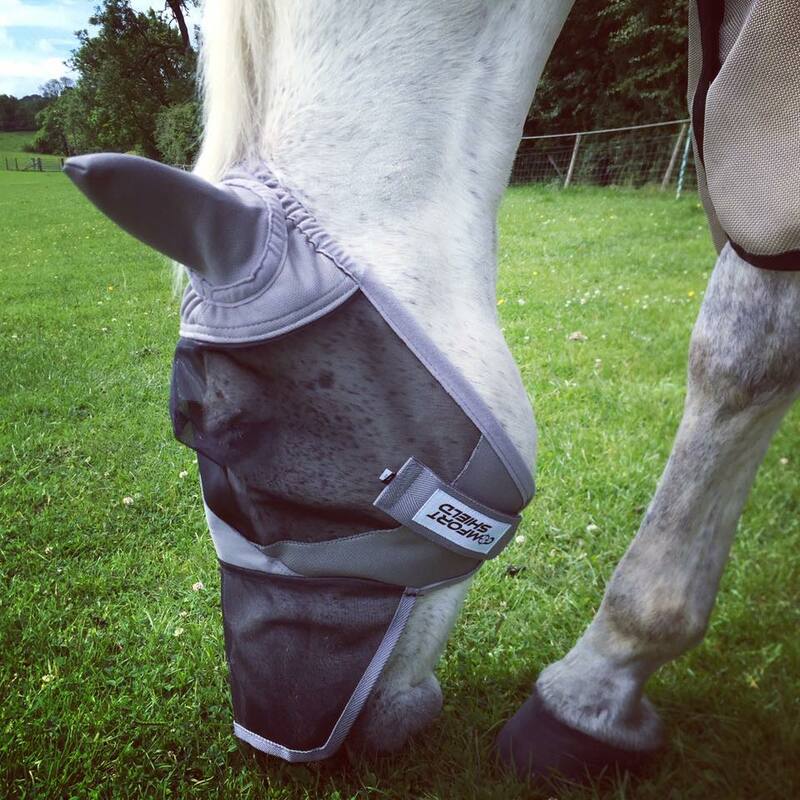 This is complimented by an elasticated velcro chin strap that allows the horse freedom of movement to chew and graze. The lightweight and breathable grey fabric also has a stretch to it and feels like it should wash well. discarded in the field by Houdini himself"
Chosen for Oscar was the Comfort Fly Shield with breathable and midge-proof ears and a nose shield - which you can opt to have without - these features are especially useful to protect sensitive or pink skinned horses against sunburn. Oscar has always been looked over by a qualified massage therapist three to four times a year with very few areas of concern. After the diagnosis of arthritic changes in Oscar's right fore pastern last year I knew that equine massage was an area of treatment I wanted to build into our healthcare routine because I had real concerns he might be over loading his other limbs, especially his right fore shoulder to compensate for the weakness. I knew a professional would be able to feel any tension, knots or soreness and intervene before they became a bigger problem. I was then faced with the challenge of time...I work 9-5, which is realistically 8-6 making my current arrangements difficult to squeeze in more regular treatments which were during the day. This is how I met Lucy Reynolds, a qualified Equine Sports Massage Therapist based in Leicestershire. Lucy instantly offered evening visits and we arranged our first for a dark, cold Winters evening, early 2017. Discussing the horses history and any presenting problems...my goodness, if there is something horse owners love doing, it's talking about their gee-gee's. Lucy has no doubt heard it all and I probably rambled on about an event two weeks ago on Thursday, the wind blew, his back tightened, then a pigeon flew out and he didn't feel quite right or that he spooked and slipped on a hack last month...can you tell me, did it pull a muscle? Yet throughout our discussion Lucy was compassionate. Actively listening to my neurotic concerns about my sound horse who has slight arthritic changes because he is simply, getting older. Conformation check..."yes, he is by Glencarrig Prince Lucy..you're looking at perfection"
Gait analysis...when discussing Lucy's observations she proved she had a sharp eye, even in the dark of a Winters evening - it is useful to have a flat clear area, both on hard and soft surfaces for this part. Saddle fit check...at this point Lucy will honestly say she is not a qualified saddle fitter, yet likes to see it both on and off the horse, girthed up too and even assessed the underside of one of my most used saddle pads. The questions she poised that I was unable to answer I noted ready for my saddle fitting back in March. I am impressed to say her instincts were proven right, she modestly nodded accepting the feedback when I explained my visit to her. Foot and farriery observations...twelve months ago this would have taken two minutes, yes he is shod every six weeks, seldom looses a shoe, I pick them out and paint them...next question? Fast forward and Lucy might have regretted having this one on the list because shortly after Lucy's first visit Oscar had gone bare behind. Lucy - keeping her own horses barefoot - was a breath of fresh air, throughout the transition, even today I feel trapped between two worlds. Lucy is open minded to both shod and unshod horses and doing what is right for both horse and rider. The conversation we had and continue to have really helps to stabilise my thoughts. Lucy can also asked to see the horse ridden or lunged. Following this thorough assessment Lucy performs a full body sports massage where soft tissue is manipulated to relieve muscular pain and assist in the prevention of future muscle injuries. The special techniques used are aimed at increasing flexibility and range of movement and Oscar certainly enjoys the whole experience, licking, chewing, yawning and lowering his head throughout. The skin deep benefits of Lucy's techniques are clear to see, improved muscle tone and skin texture, a supple horse who uses his muscles at maximum efficiency. The internal benefits being too long to list Lucy's website does an excellent job of this, click here. 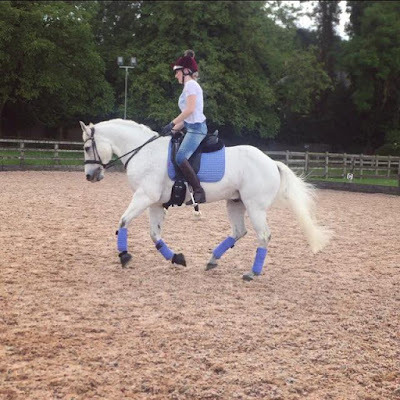 Lucy has an expert understanding of equine anatomy and the interaction of bones, joints and muscles. This was the basis of her ICAT Diploma (Institute of Complimentary Animal Therapies). Qualified to BHS Stage 3, Lucy is currently studying towards Stage 4 and is passionate about her self development. A follow up appointment is £30 and last approximately one hour, Lucy remembered Oscar, and I felt valued as we discussed the case notes from our previous session. Lucy likes to understand your horses lifestyle, your discipline, whether you do it for fun or competitively and tailors her follow up treatment accordingly. Always finishing with stretches and aftercare exercises that are recommended after exercise when your horse is warmed up to work on in-between visits - Oscar's favourite part because Lucy always has mints. Piglet. Was LeMieux Corn Blue Made For Gee Gee & Me? 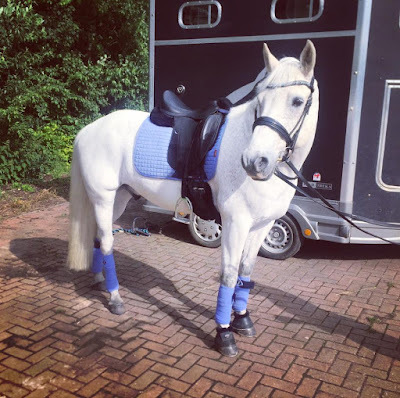 Gee Gee and Me make no secret that we love LeMieux and as Official Bloggers were given the honour of modelling the gorgeous Corn Blue LeMieux ProSport Suede Dressage Square and matching Luxury Polo Bandages from their new Spring/Summer 2017 Collection. Gee Gee and Me own *blushes* eight LeMieux ProSport Suede Dressage Squares (and the number of Luxury Polo Bandages...I'd rather not count), the quality, design and attention to detail teamed with a stylish colour range and affordability make LeMieux my number one for matchy dressage wear. Want to know why I love them so much? Read here. Want Corn Blue...? Thought so, click here.